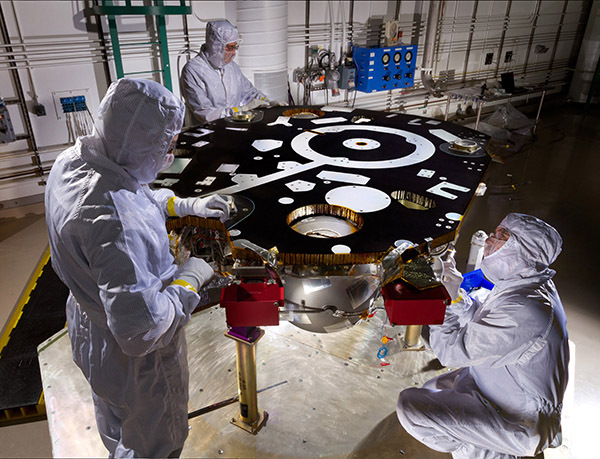 Lockheed Martin has started the assembly, test and launch operations (ATLO) phase for NASA’s InSight Mars lander spacecraft. The InSight mission will record the first-ever measurements of the interior of the red planet, giving scientists unprecedented detail into the evolution of Mars and other terrestrial planets. InSight is scheduled to launch in March 2016. A critical stage in the program, ATLO is when assembly of the spacecraft starts, moves through environmental testing and concludes with its launch. Over the next six months, technicians will install subsystems such as avionics, power, telecomm, mechanisms, thermal systems, and guidance, navigation and control. Science instruments will also be delivered by the mission partners to Lockheed Martin for integration with the spacecraft. In addition to the lander, the spacecraft’s protective aeroshell capsule and cruise stage (which provides communications and power during the journey to Mars) are also undergoing assembly and testing alongside the lander. Once the spacecraft has been fully assembled, it will undergo rigorous environmental testing in the summer of 2015. InSight stands for “Interior Exploration using Seismic Investigations, Geodesy and Heat Transport” and it is more than a Mars mission. This NASA Discovery-class mission is a terrestrial planet explorer that will address one of the most fundamental issues of planetary and solar system science; understanding the processes that shaped the rocky planets of the inner solar system (including Earth) more than four billion years ago. The InSight mission is led by Bruce Banerdt of the Jet Propulsion Laboratory (JPL). The science team includes U.S. and international co-investigators from universities, industry and government agencies. The German Aerospace Center (DLR) and the French space agency (CNES) are also each contributing an instrument to the two-year scientific mission.